Let’s go for dinner they said. That’s how it began. A simple suggestion and discussion that happened to coincide with the announcement that Blog Awards Ireland wouldn’t be taking place this year. That suggestion for dinner and drinks quickly snowballed into a full blown awards event, complete with ten categories, some nifty trophies, fantastic sponsors, and the best goodie bags going. I am the first to admit, I had my doubts we could pull it off. But Sylda from Mind the Baby reassured me that we could do this in our sleep. And when Sylda says something, you believe her. So that was that – we were staging our own awards night. We quickly pulled together a committee with all the talent needed. Mind the Baby explained the plan to us and then set about arranging a venue – the Rooftop Terrace in Odessa Club & Restaurant no less. The Airing Cupboard designed our logo and colour scheme. At the Clothesline, The Busy Mama’s, and Raising Elves started organising sponsors, while Dolly Dowsie started planning the goodie bags. And meanwhile I took a crash course in Advanced WordPress and figured out how to facilitate nominations, voting, and ticket sales on the site. That was February. I look back now and the weeks seem to have passed in a whirlwind of emails, phone calls, vote tallying, and goodie bag packing. Before we knew it, it was 2.30pm on April 25th and we had three hours to go. It was around that point that it struck me that choosing the roof top terrace in a building with no lift may not have been the best idea. But somehow we managed to get everything upstairs and set up. At 5.22, Deborah reminded me that I might want to get changed out of my jeans and tshirt. And by 5.30, I was downstairs greeting our guests as they arrived. All 56 of them for dinner. I started the Irish Parenting Bloggers group on a whim – a small bunch of us who’d gotten to know each other through Twitter were trying to set up a lunch or dinner. The idea fizzled out, but the group remained. And then over the years it grew. Mind the Baby and At the Clothesline joined me as administrators. I added the directory and web site, with the idea of building something that would promote the group and its members. And while all this was going on, friendships formed. There are lots of blogging communities out there, but I like to think we built something different. A blogging village if you like, with a focus on the people, not the blogs. We try to build each other up, rather than compete. That was the real achievement that I felt the night of the awards – and it wasn’t my achievement. It was the entire group’s. People hadn’t come together for a competition – they had come together for a celebration. Old friends greeting new friends. People who’d never met before in real life launching straight into conversation as though they saw each other every day. At times, I wondered what the sponsors and the bloggers’ guests who were attending the awards with us must have thought, because it was a night for in-jokes and group hugs. Sylda MC’ed, Suzy tweeted, Laura took photos, Deborah loaded up the music (and the occasional Gentlebirth track), and I handed over envelopes and teapots. And we smiled and laughed and chatted our way through the evening. 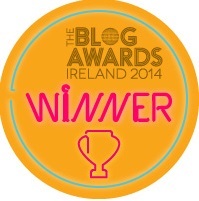 I caught up with Office Mum (winner of Best Parenting Blog on the night!) and Another Drop of Ink over dinner. I admired Bumbles of Rice‘s new shoes before we went upstairs. Swapped sling recommendations with Stuff and Nothing, searched for her lost phone with Glitter Mama Wishes, chatted to “old friends” like My Thoughts on a Page (who came away with both Best Personal Blog and Best Writer), Kate Takes 5, Proper Fud, FatDebSlim, and Where Wishes Come From (who won Most Beautiful Blog), and hopefully made some new friends in Lady Nicci and Raising Ireland, and so many more. I’d better stop now, because I’m in danger of trying to list everyone, and I will inevitably forget one blog if I do that and hurt someone’s feelings! And if me going on about it, isn’t enough for you, check this out just to see what we achieved: #IPBAwards 2015: How did we do? What a lovely write up. Well done to you all for the organising, and thanks for admiring my hastily acquired shoes! I think I’m only recovering from it now! I suppose it could be worse. You could have compared me to Thatcher. It would be great if you could make it if we do it again Nicola. Congratulations on winning! It was a great night – you should be very proud 🙂 It’s a lovely community that you started. No wonder everyone was so excited to meet up! Stuff and Nothing recently posted..Toddler Rituals – how do you do yours? We’ll just have to do it more often! I was very impressed with how efficient and professional the whole process was. Every detail was thought of. You and the rest of the gang did a fabulous job – just move them to Galway next year! Mary M Conneely recently posted..Autism Awareness Month: What does it really mean? Sorry Mary. I think you’ll have to argue that one with the bloggers from Cork. They’ve been shouting for cork for the next meet up. It was Julie. Great fun all around.